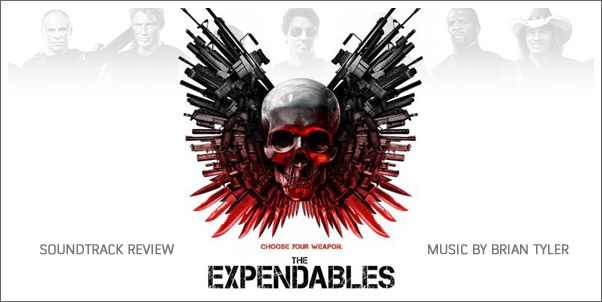 For what seemed an inevitable (if somewhat late-coming) mash-up of action movie awesomeness, BRAIN TYLER’s score for THE EXPENDABLES is somewhat...formulaic? I hesitate to describe it as such, because I’m still waiting for it to “hit” me. For a project of this calibre, I want overblown, over-the-top music. Instead, a fairly standard action-movie score, with pulsing beats and drawn out winds and strings is delivered. This doesn’t make the score bad by any means, not for someone who likes the odd action score. However, for the composer who made such a big first impression with powerhouse works like CHILDREN OF DUNE, and cues like “Summon the Worms” (a piece that is sure to secure Tyler’s immortality amongst epic-movie trailers editors), the merely serviceable score for THE EXPENDABLES feels like a step to the side. Do I expect too much from a still-“junior” film composer? Perhaps. If that is the case, though, at whom do I shake my fist? To be fair, I’m still waiting to catch the accompanying film, but I am still of a sort that likes to listen to scores before I see the movie. Based on the casting roster, (Stallone, Statham, Willis, Li, et. al.) I want to hear the the skies rock! I want the faux-Bruckheimer score that Harry Gregson-Williams provided for TEAM AMERICA and the action-genre pastiche that Theodore Shapiro gave TROPIC THUNDER. Granted, those films were comedies that treated their subjects with an almost straight-laced mock-epic quality...but really, should I take any movie that delivers--in one celluloid package--Rambo, The Transporter, John McClane, Wong Fei-hung, Ivan Drago, The Terminator, a smattering of WWF standards, and...ah...Mickey Rourke....seriously? Besides, the album art features an estimated eleventy-one billion automatic firearms and John-Rambo trademark-bad-guy-stabbers all garnishing a Big Freaking Skull. Your other soundtrack CDs will cower in fear from the total awesomeness of this CD on your library shelf.